One of the best things about living in a huge state like Texas is having an abundance of great places to visit for a quick road trip. We love being able to jump in the car and hit the road for a quick getaway whenever the mood strikes! Earlier this year, we spent a weekend getaway visiting the DFW Metroplex. Today, I'm sharing our experience visiting Fort Worth for 24 hours. Fort Worth is located west of Dallas and has a totally different vibe. 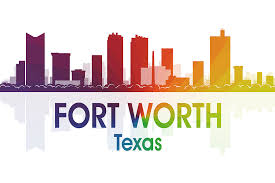 According to Visit Fort Worth: "The City of Cowboys & Culture is the 15th-largest city in the United States [874,000 residents] and part of the No. 1 tourist destination in Texas, welcoming 9.1 million visitors annually." We headed to Fort Worth from San Antonio -- a quick 4.5-hour drive -- excited to see what excitement the city had to offer! En route to Fort Worth, we stopped in Desoto for a late lunch at Top 5 BBQ -- one of Texas Monthly magazine's Top 50 BBQ Joints in Texas. That designation always guarantees a fabulous BBQ experience. As this video shows, the smoked meat at family-owned Top 5 BBQ definitely did NOT disappoint! 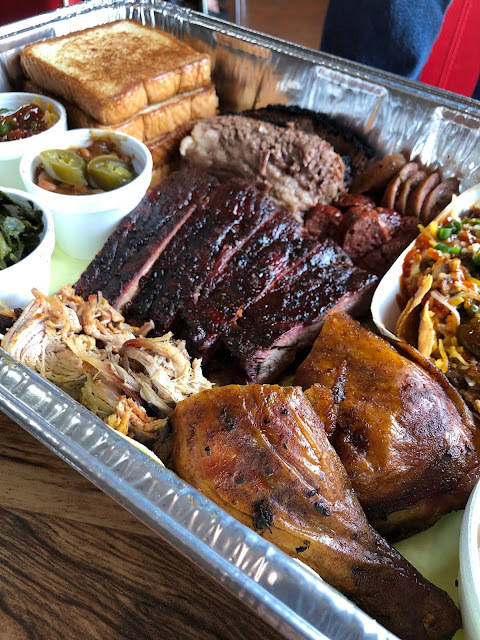 We were warmly greeted by owner Kendon Greene and brought his hand-selected sampler of Top 5's delicious menu items -- including smoky pulled pork, juicy smoked chicken, tender prime brisket, meaty ribs, and sausage. We also sampled their creative -- and delicious -- signature BBQ Nachos. Imagine crispy house-made tortilla chips topped with chopped brisket, cheddar and queso, BBQ sauce, green onion, and jalapeno. They're a perfect mix of Texas BBQ and Tex-Mex!! Our meal also included a variety of well-prepared sides. We especially loved their smoked beans and creamy potato salad. In Texas, BBQ meals are commonly capped off with fruit cobbler for dessert -- and Top 5's peach cobbler is a winner! The cobbler was the perfect ending to a fabulous meal. 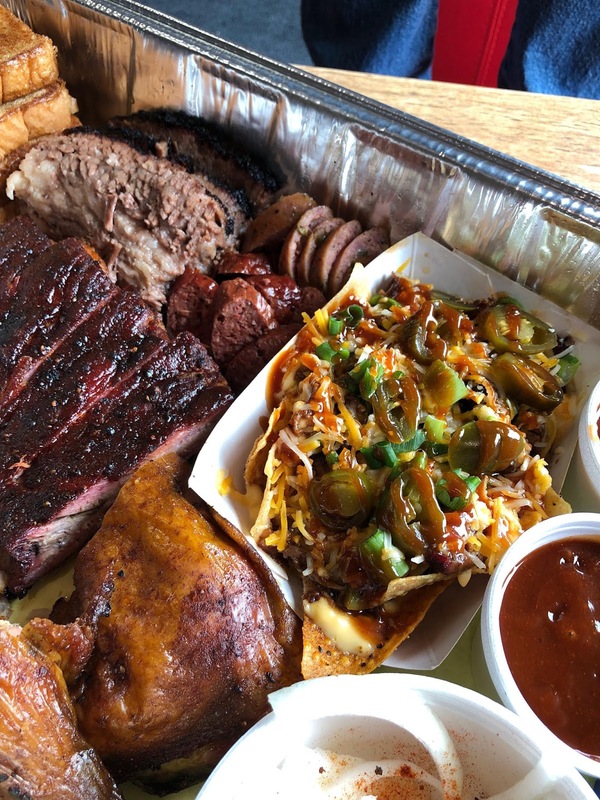 If you find yourself visiting the Dallas-Fort Worth area, a pit stop at Top 5 BBQ is a definite must!! We left Top 5 BBQ stuffed with delicious BBQ, put on some tunes, and drove the final 30 minutes of our road trip to Sheraton Fort Worth Downtown Hotel, our home base for our stay. We dropped our car with the valet and quickly checked in, taking note of the spacious lobby -- which had lots of great nooks for sitting and relaxing. This pet-friendly hotel has 425 rooms and four suites. Rooms feature the comfortable Sheraton Signature Bed, mini-refrigerators, flat-screen TVs, and Wi-Fi. Upgrade Club Lounge rooms also include guest access to Club Lounge perks -- including complimentary breakfast and afternoon snacks, wine, and appetizers. We stayed in a Club Lounge Junior Suite -- which featured a bedroom with a King four-poster bed, a separate living area with sofa and chairs, and a spacious bathroom. The suite was HUGE (615 sq. ft.) and decorated in soothing shades of blue and gray. We settled in and decided to check out the Club Lounge. It featured panoramic Downtown Fort Worth views and a range of early evening snacks -- including wine and other beverages, fruit, cheese, and quesadillas. There was even sodas, granola bars, and chips that we could take back to our room for any late-night munchies! After a busy day driving from San Antonio, we wanted something casual and relaxing for dinner. The relaxed vibe and delicious burgers at Liberty Burger were exactly what we were looking for! The fast-casual restaurant concept offers burgers and sandwiches made from grass-fed beef and bison, hormone-free chicken breast, and minimally processed ground turkey breast. They also offer handmade French fries, brown-sugar sprinkled sweet potato fries, and thick-cut onion rings on the side. Liberty Burger also features handmade custard shakes...including boozy Adult Milkshakes...and Personal Pies topped with hand-whipped meringue. 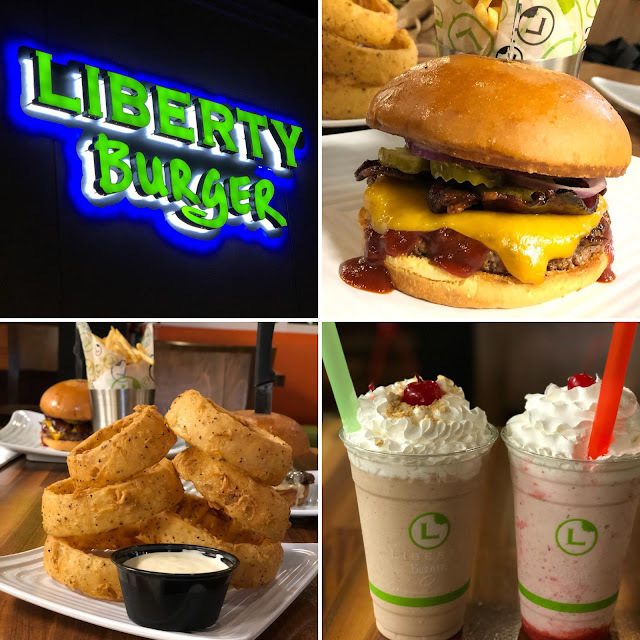 As this video shows, the Liberty Burger experience is head and shoulders above the typical burger experience! Michael and I stepped up to the counter and ordered a pair of burgers, shakes, and a shared order of Big O Rings. Michael opted for the Wild West burger, which included cheddar, bacon, pickles, onions, and a generous amount of spicy chipotle BBQ sauce. I decided to give the Baby Bella a try -- it was made with queso blanco, sautéed baby bella mushrooms, grilled onion, and a creamy basil-garlic aioli. Michael went with his signature Strawberry shake, while I opted for the decadent Nutella & Graham Cracker -- which tasted like a liquid version of a rich chocolate pie. And the onion rings? Perfection! Large slices of onion dipped in house-made buttermilk batter and fried crisp. They were tender and sweet...not at all greasy. NOTE: The Liberty Burger location we visited in Fort Worth recently closed. However, Liberty Burger has five other locations in the DFW Metroplex that serve the same great menu items! After dinner, we visited Fort Worth's bustling Sundance Square area before returning to the Sheraton. 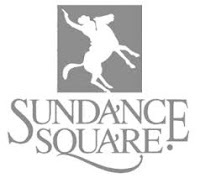 Sundance Square is a 35-square-block Downtown entertainment district. This area has 30+ restaurants, live music clubs, theatres, shops, and the Bass Performance Hall -- one of the Top 10 opera houses in the world. Sundance Square is the perfect place to take an evening stroll and people watch too! Parking in Sundance Square is free weekdays after 500 p.m. and all weekend long. After our stroll, we made our way back to our suite at the Sheraton, where we fell into our comfy King bed and slept great! The next morning, we decided to check out the included breakfast at the Club Lounge. The Club Lounge breakfast included a wide range of hot and cold items -- including fresh fruit and juice, muffins and pastries, cold cereal, an oatmeal bar, yogurt and toppings, scrambled eggs, and bacon. It also featured an easy-to-use cappuccino bar featuring Starbucks coffee to get your morning caffeine fix. This convenient in-house breakfast was a great way to start our morning! We had a late breakfast after sleeping in a bit that morning, so it was time to gather our bags and check out of the Sheraton Fort Worth Downtown after we leisurely enjoyed our food -- and the views of Downtown! Our brief stay in Fort Worth was an excellent introduction to this vibrant city. We can't wait to return for a full weekend of exploring even more of Fort Worth's restaurants and attractions! Disclosure: Top 5 BBQ and Liberty Burger provided us with complimentary meals to facilitate inclusion in this article. Sheraton Fort Worth Downtown provided a hosted suite and admission to the Club Lounge to facilitate coverage as well. All opinions shared are solely my own.